A Retrospective of the presentation made in Session 1D at ASOR’s 2014 Annual Meetings in San Diego. In 2007 the Umm el-Jimal Project (UJP) made a thematic shift away from stress on academic archaeological research to site management with twin foci, preservation and community engagement. Site preservation on the ground was complemented with the virtual kind, digital documentation and archiving of information on the internet. The new visibility of Umm el-Jimal in virtual reality opened new opportunities and directions in site preservation, especially the engagement of the modern community in that process. For we became convinced that all the preservation one could manage to do would be dead-ended as long as the modern community remained disengaged. Thus we engaged the community in two ways: 1) We documented it as the “living” outcome of the archaeological heritage and 2) we involved it in site management and preservation. For a fuller version of this argument see NEA 76, No. 3 (Sept. 2013): 132-140. The following photo essay on the UJP activities in 2014 gives a good cross-section of the work as it has grown in this new direction and also updates our 2012 ASOR blog-post. Presentation. 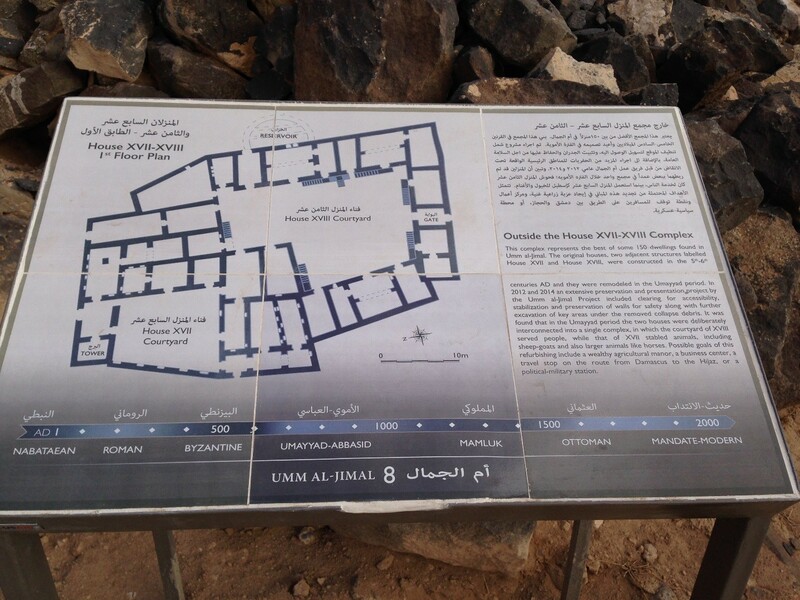 House XVII-XVIII, originally two Byzantine houses, were merged into a larger single-purpose Umayyad complex, whose presentation included the placement of six interpretive signs (designed by Open Hand Studios), part of a site-wide interpretive trail being completed in 2015-6. Celebration. June 6, 2015 U. S. Ambassador Alice Wells came to celebrate the wrap-up of the House XVII-XVII Preservation, enabled by grants from the Ambassadors Fund for Cultural Preservation. Here Muaffaq Hazza explains a feature of the upper levels of House XVIII. See “AFCP Grant Wrap Event” on the UJP blog for more. Photo by Bert de Vries. Gender balancing. 2014 saw the launch of the Women’s Empowerment Project, conceived by UNESCO, funded by UN Women, and carried out in partnership with UJP. Here two UJ women, Ahlam Kurdi and Silwa Masa’eid excavate in the House XVIII courtyard, June 2014. Photo by Jeff DeKock in the House XVIII Courtyard. Calvin College Field School. The excavation shown in the previous photo was part of the 2014 Field School required in the Calvin Archaeology Minor. Nine of the above were Calvin undergraduates fulfilling this requirement. The team photograph also includes seven Calvin alumni, and fifteen Jordanians. Heritage Training. 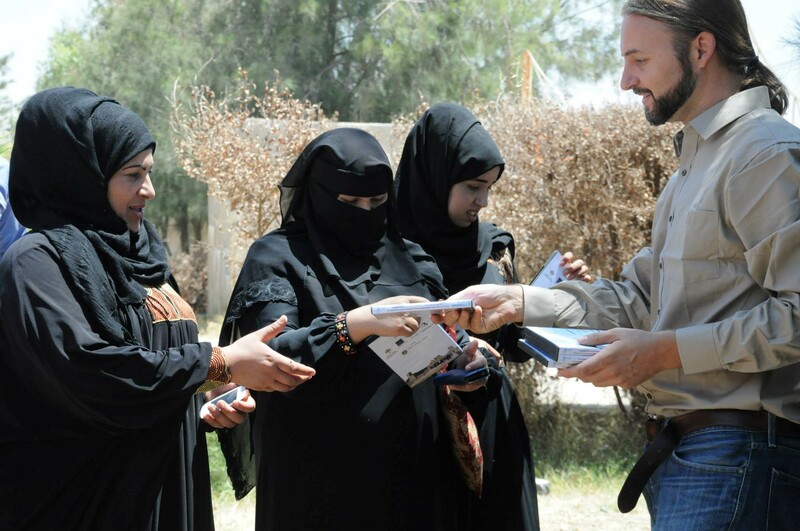 In the fall of 2014 Sally de Vries taught the Heritage of Northern Jordan to a class of 23 Umm el-Jimal women. 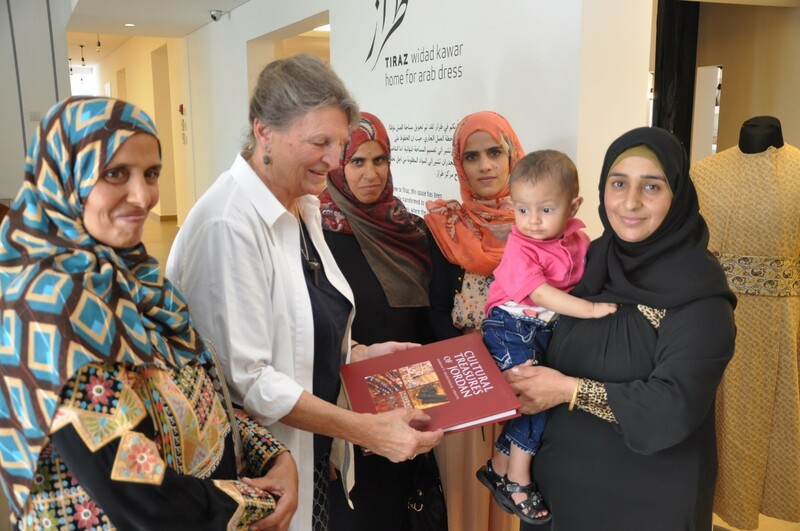 Here she shows them the Cultural Heritage of Jordan on a visit to Tiraz, Widad Kawar’s museum of Arab costumes in Amman. Archaeology training. Also in the fall 2014 Bert de Vries taught the women Archaeology, including the stratigraphy of Jordan, and the archaeology of Umm el-Jimal, Jerash and Amman. Here he explains the inscriptions on the UJ Barracks Tower. Craft training. 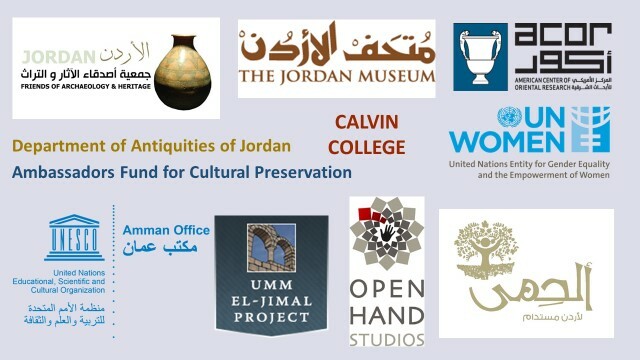 UNESCO “Empowerment” included craft training in embroidery and basalt carving, in a program overseen by al Hima, a Jordanian NGO created by Hazem Malhas for heritage and archaeology based community development. Basalt small object carving ‘graduated’ to marketable items in 2015. Photo by Sally de Vries. Satisfaction. UNESCO commissioned Open Hand Studios (OHS) to produce a short film on the 2014 Empowerment of Women’s Project. Jeff DeKock, the producer, distributes copies of the film to its stars, June 16, 2015. Women’s Empowerment Project video on the UJP blog. “Teach the Children Well.” This girl was one of 80 children at a drawing contest in the ruins, 18 October 2014, a celebration which drew 130 community members. 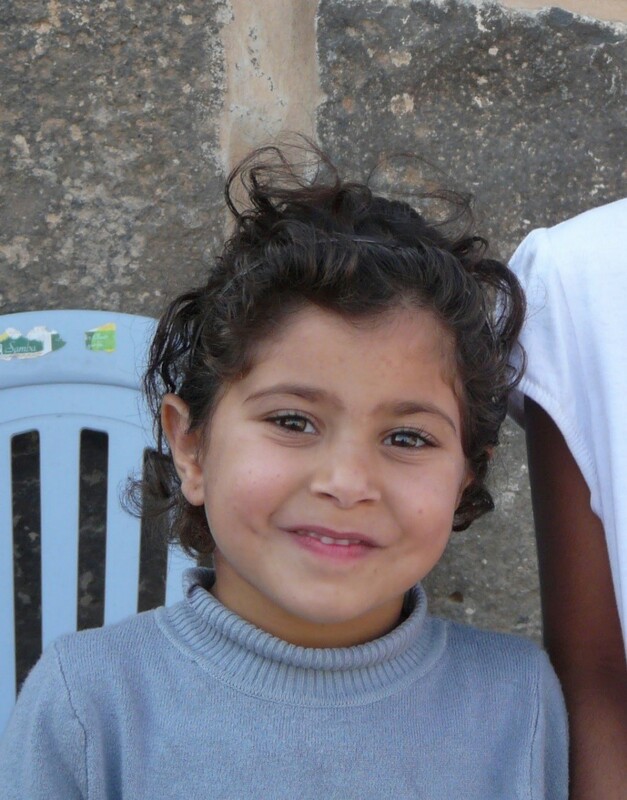 UJP’s outreach to the children includes an Education Manual for school curriculum. Water Reclamation. 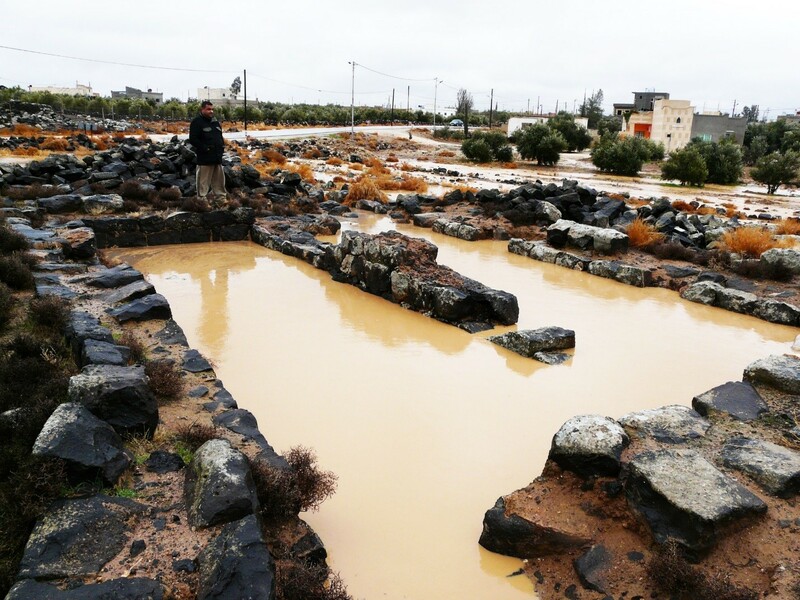 The UJP-OHS Water Restoration project was launched in 2014 with the mapping of the ancient water collection and storage system by a Yarmouk University team (Abdullah Shorman and Muwafaq Bataineh). Here Muaffaq Hazza ponders the overfull Reservoir No. R1, winter 2013. Logos of the many organizations involved. Cooperation and Coordination. This collage of ‘brands’ represents the many orgs necessary to make the multi-faceted preservation-and-community program come to reality. Not mentioned are the UJ Women’s Cooperative and the UJ Municipality’s Mayor Hasan Fahed, UJP’s most eager booster. Enjoyment. 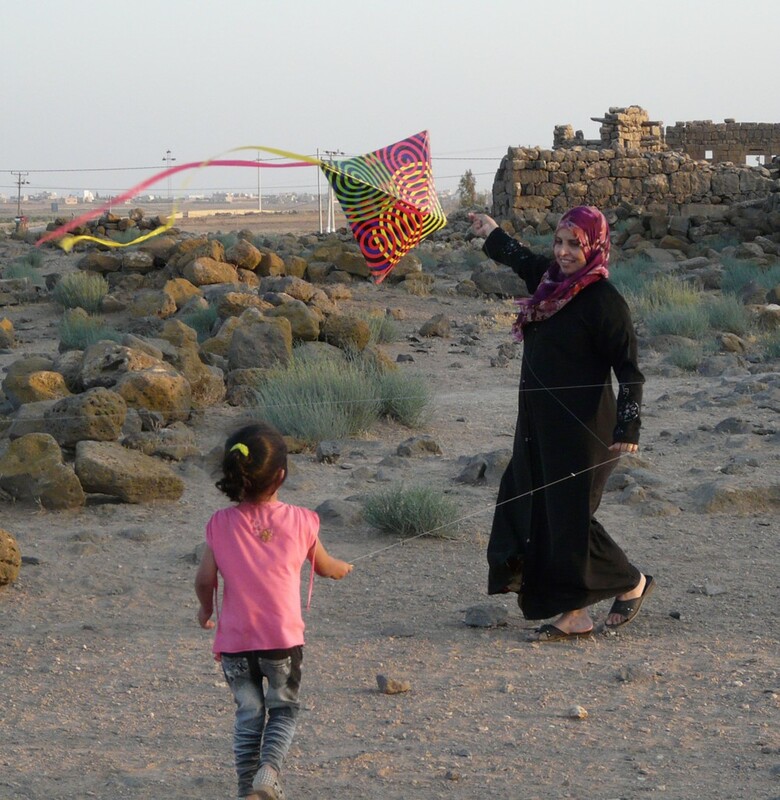 The end of the story is joy and enjoyment, here ‘lived’ by Fatima Hazza’s and daughter Ayya’s kiting in the ruins on a breezy day ‘once upon a time’ not long ago. UJP logo design, Open Hand Studios. A version of this post also appeared on the ASOR (American Schools of Oriental Research) blog in August 2015. Bert de Vries (Director, Umm el-Jimal Project) is professor emeritus of the History Department, but he continues to administer and teach the Archaeology Minor Programat Calvin. Ironically, as his teaching duties faded the Umm el-Jimal Project, which he directs, has flourished. 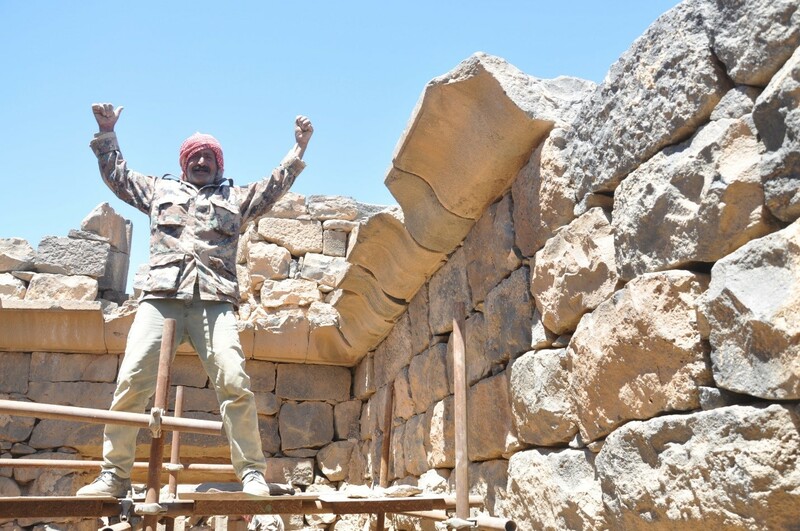 This entry was posted in Bert de Vries and tagged archaeology, community, excavation, Jordan, preservation, UJP, Umm el-Jimal, UNESCO. Bookmark the permalink.